LiveCash is the new engine room of inniAccounts – a place where you can quickly access all of your most vital financial information and find it presented in the clearest possible way. With LiveCash you’ll be able to stay on top of your upcoming bills, drill into the details of your income and expenditure and even customise the way you view your accounts. You’ll find LiveCash on your newly redesigned company homepage. inniAccounts Mobile takes ‘instant access’ to the next level by giving you a real, live view of your financial information on your mobile phone – literally at your fingertips. inniAccounts Mobile will give you instant access to LiveCash, plus you can quickly enter timesheets, expenses and milage on the go. You can access inniAccounts Mobile using either an iPhone or an Android-based handset (such as the Google Nexus One, the HTC Magic or the HTC Legend). Report Centre provides you with all the financial insight you’ll ever need in a really easy to use format. 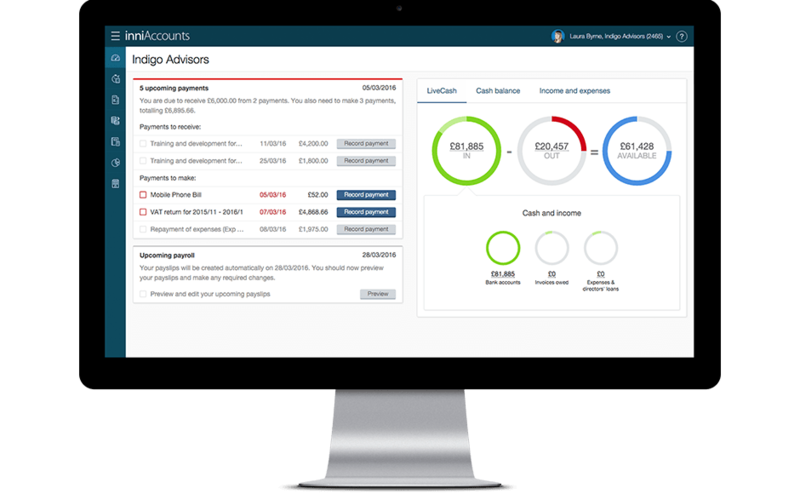 You can choose from a wide range of reports on everything from to trial balances to mileage tracking, open them with a single click, and drill down to individual transactions to give you a really in-depth view of your finances. You can even export your reports in Word, Excel or PDF format. These features are exclusive to inniAccounts – we’re confident that you won’t find a more comprehensive online accountancy service. If you’re an inniAccounts Plus or Premium client you can access these features today – just login as usual.